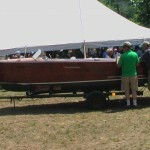 The New Englands Boat Auction is also the Museums largest annual fundraiser. 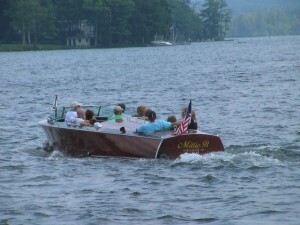 In 1992, antique and boat enthusiasts came together with the goal of preserving the heritage that is unique to New Hampshires Lakes. We were able to take a look around at the nautical items, collectibles and boats provided by donors just before the bidding began. 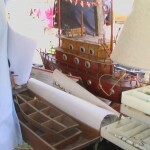 Aside from the luxurious antique boats, there was everything an enthusiast could desire from handmade cast iron mermaids, duck decoys, paintings, port holes, boat hardware, antique nautical books and charts, an array of gorgeous lighthouse and brass anchor lamps and my favorite a Witchery Print and china set. The Auctions Master of Ceremonies, Peter Coccolo looked cool throughout the pressure of the mounting bids in his crisp white shirt and khaki pants while the rest of us melted under the large tent. My favorite part of the day was when a beautiful 1928 22 Chris-Craft Cadet named Morning Star from Long Island came up for the bidding. Couldnt you just imagine yourself riding in it with the wind blowing against your cheeks on the Big Lake? I sure did. After the show, I caught up with Peter Coccolo and one of the auctions organizers. 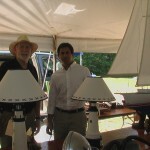 Mr. Coccolo said the auctions attendance was great and was an overall success throughout the day despite the heat. Bruce MacLlellan, one of the organizers said the auction is just one of the many amazing things about Wolfeboro. When I asked him, why someone new like me should keep coming back he said, Diversification Wolfeboro has the Craft Fair, our New England Vintage Auction, and so much more.